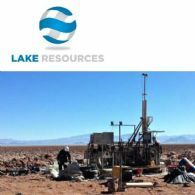 Lake Resources NL (ASX:LKE) (FRA:LK1) is pleased to confirm that a second, larger diamond drill rig operated by Foraco Argentina SA has commenced drilling at Lake&apos;s 100% owned Cauchari Lithium Brine Project. 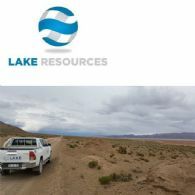 Lake Resources NL (ASX:LKE) provides the Company&apos;s Quarterly Activities Report. 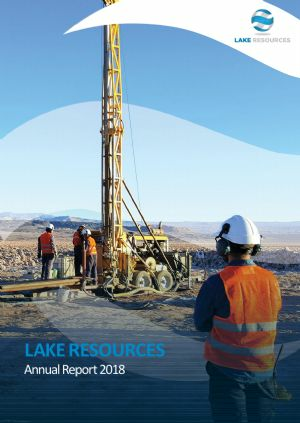 Argentine-focused lithium exploration and project development company Lake Resources NL (ASX:LKE) has extended drilling activities at its 100%-owned Kachi Lithium Brine Project in Catamarca Province with assay results reinforcing the large scale and quality of the discovery. Argentine-focused lithium exploration and project development company Lake Resources NL (ASX:LKE) has started drilling at the 100% owned Cauchari Lithium Brine Project. 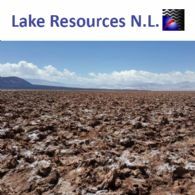 Lake Resources NL (ASX:LKE) directors present their report, together with the financial statements, on the consolidated entity consisting of Lake Resources NL and the entities it controlled at the end of, or during, the year ended 30 June 2018. 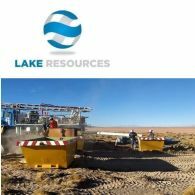 Argentine-focused lithium exploration and project development company Lake Resources NL (ASX:LKE) is mobilising a diamond drill rig to LKE&apos;s 100% owned Cauchari Lithium Brine Project. Argentine-focused lithium exploration and project development company Lake Resources NL (ASX:LKE) has taken the decision to exercise the option over a large belt of outcropping pegmatites in the Ancasti area of Catamarca province, Argentina. 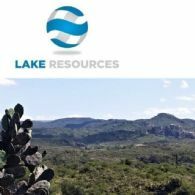 Argentine-focused lithium exploration and project development company Lake Resources NL (ASX:LKE) is pleased to confirm that the $1 million financing of almost all of the remaining 10c options has now closed. 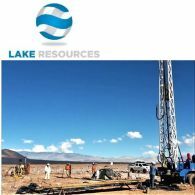 Argentine-focused lithium exploration and project development company Lake Resources NL (ASX:LKE) is pleased to confirm that following recent positive discussions with relevant authorities in Argentina this week, drill hole locations have now been determined for the upcoming drill program at the 100%-owned Cauchari Lithium Brine Project. Argentine-focused lithium exploration and project development company Lake Resources NL (ASX:LKE) and Lilac Solutions, Inc. are pleased to announce a significant step forward in the development of Lake&apos;s 100%-owned Kachi Lithium Brine Project in Argentina. 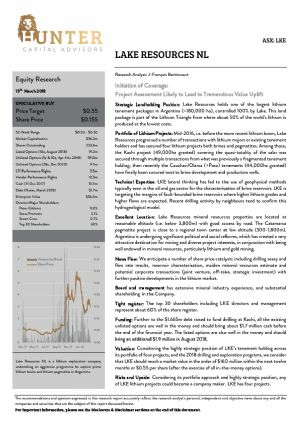 Argentine-focused lithium exploration / development company Lake Resources NL (ASX:LKE) is pleased to announce that recent passive seismic geophysics show a likely extension of high-grade lithium brine sequences from adjoining world-class lithium resources into Lake&apos;s 100%-owned Cauchari Lithium Brine Project. 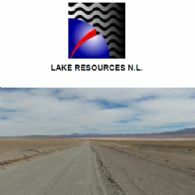 Argentine-focused lithium exploration and project development company Lake Resources NL (ASX:LKE) advises that Managing Director, Mr Steve Promnitz, has spoken with Boardroom Media today to discuss the Company&apos;s exploration and development plans for its 100%-owned Cauchari Lithium Brine Project in Jujuy Province, Argentina. 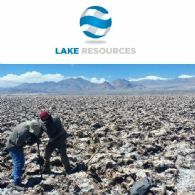 Argentine-focused lithium exploration / development company Lake Resources NL (ASX:LKE) is pleased to announce that it will shortly commence drilling at its 100%-owned Cauchari Lithium Brine Project. 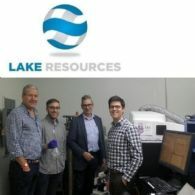 Argentine-focused lithium exploration and project development company Lake Resources NL (ASX:LKE) is pleased to announce that it will shortly commence drilling at its 100%-owned Cauchari Lithium Brine Project which adjoins SQM/Lithium Americas and Orocobre/Advantage Lithium&apos;s world-class combined 14.8 Mt LCE lithium brine projects. 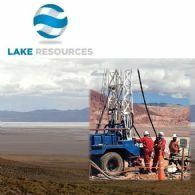 Argentine-focused lithium exploration and project development company Lake Resources NL (ASX:LKE) has extended drilling activities with results reinforcing the large scale and quality of its 100%- owned Kachi Lithium Brine Project in Catamarca Province. 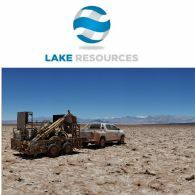 Lake Resources NL (ASX:LKE) is an exploration and development company with one of the largest lithium lease holdings in Argentina of 180,000 hectares, including areas under option with four prime lithium projects: 3 brine projects and 1 hard rock project. Each project is capable of being a &apos;company maker&apos;. Argentine-focused lithium exploration and project development company Lake Resources N.L. (ASX:LKE) advises that Lake has entered into an Options Underwriting Agreement with a group of current shareholders as Joint Underwriters who meet the requirements to perform this service. Lake Resources NL (ASX:LKE) provides the Company&apos;s EGM Presentation. Lake Resources N.L. (ASX:LKE) has lodged the attached Short Form Prospectus with ASIC today whereby the Company intends to issue 16,666,667 Options to Placement Applicants who participated in the Placement by the Company in March 2018 and 16,650,000 Options to Noteholders who applied for Options under the Note Issue. 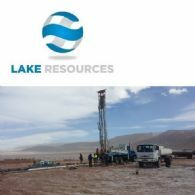 Argentine-focused lithium exploration and project development company Lake Resources NL (ASX:LKE) is pleased to provide an update on drill results and ongoing exploration activities at its 100%-owned Kachi Lithium Brine Project in Catamarca Province. Argentine-focused lithium exploration and project development company Lake Resources NL (ASX:LKE) is pleased to report initial drill results and ongoing exploration activities at its 100%-owned Kachi Lithium Brine Project in Catamarca Province. 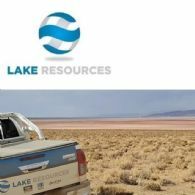 Lake Resources NL (ASX:LKE) provides the Company&apos;s Quarterly Activities Report for the period ending 31 March 2018. Lithium exploration company Lake Resources N.L. (ASX:LKE) has completed the first rotary drill hole to 240 metres with slotted casing in place to 237 metres to allow testing and sampling at the Company&apos;s 100%-owned Kachi Lithium Brine Project in Catamarca province, Argentina. Lithium exploration company Lake Resources N.L. (ASX:LKE) announces that it has secured commitments to raise $4.5 million (before costs) in an oversubscribed private placement by way of the issue of 33,333,335 new ordinary LKE shares at $0.135 per share with an attached 1-for-2 option exercisable at $0.20 on or before 15 December 2018, to sophisticated and professional investors. The directors present their report, together with the financial statements, on the consolidated entity consisting of Lake Resources NL (ASX:LKE) and the entities it controlled at the end of, or during, the half-year ended 31 December 2017. Investors in Argentinean focused lithium exploration company Lake Resources N.L. (ASX:LKE) are advised that Hunter Capital Advisors has today published a research report on the Company. Lithium exploration company Lake Resources N.L. (ASX:LKE) has advanced the first rotary drill hole to a depth of 240 metres with encouraging indications of conductive brines in two thick sandy aquifers at the Company&apos;s 100%-owned Kachi Lithium Brine Project in Catamarca. Lake Resources NL (ASX:LKE) provides the Company&apos;s latest presentation. Lithium exploration company Lake Resources N.L. (ASX:LKE) additional larger rotary drill rig will commence operations in the coming days to accelerate the drilling of lithium brines within conductive sands at the Company&apos;s 100%-owned Kachi Lithium Brine Project in Catamarca. Argentina focused lithium exploration company Lake Resources N.L. (ASX:LKE) is pleased to provide shareholders with a video interview with Finance News Network regarding the company&apos;s landmark deal in Argentina in Jujuy province as discussed by Lake&apos;s Managing Director, Steve Promnitz. 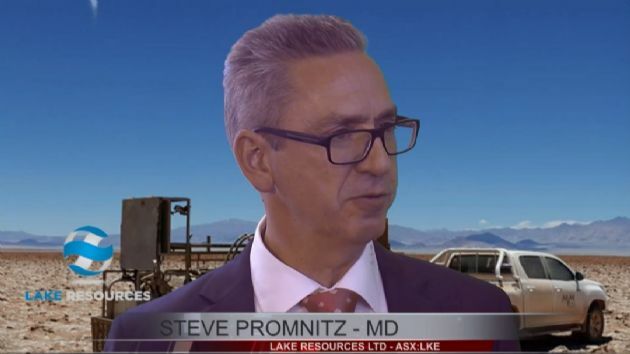 Lake Resources Ltd (LKE.AX) Managing Director Steve Promnitz is interviewed by Tim Mckinnon of ABN Newswire regarding the recent agreement with the Jujui Province and the company&apos;s lithium projects in Argentina. 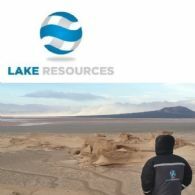 Lake Resources NL (ASX:LKE) provides the Company&apos;s latest Presentation titled "Large Scale - Jujuy Leases Heartland of Prime Lithium". Argentinean focused lithium exploration company Lake Resources N.L. (ASX:LKE) is pleased to advise it will host an investor teleconference with Managing Director, Steve Promnitz, on Friday, 2 March 2018 at 10:30 am Australian Eastern Daylight Time, to discuss the recent developments regarding the landmark agreement with Jujuy Province, Argentina. Argentinean focused lithium exploration company Lake Resources N.L. 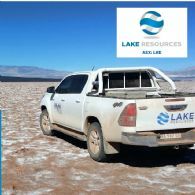 (ASX:LKE) is pleased to announce the signing of a landmark agreement with Jujuy Province, Argentina that confirms tenure of Lake&apos;s ~45,000 hectares of mining leases which covers Lake&apos;s Olaroz - Cauchari Lithium Brine Project and Paso Lithium Brine Project in Argentina. Lithium exploration company Lake Resources N.L. (ASX:LKE) has sourced an additional larger rotary drilling rig to accelerate the drilling of lithium brines within porous sands, which are excellent host horizons, at the Company&apos;s 100%-owned Kachi Lithium Brine Project in Catamarca. Further to Lake Resources N.L. (ASX:LKE) announcement of 3 November 2017, the Company is pleased to confirm that it has completed the issue of 1,665,000 unsecured notes to sophisticated and professional investors, raising a total of $1.665 million for the Company. 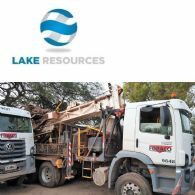 Lake Resources NL (ASX:LKE) provides the Company&apos;s Quarterly Activities and Cashflow Report for the period ending 31 December, 2017. Lithium exploration company Lake Resources N.L. (ASX:LKE) is pleased to report that drilling of lithium brines within porous sands, which are excellent host horizons, is progressing at the Company&apos;s 100%-owned Kachi Lithium Brine Project in Catamarca. Lithium exploration company Lake Resources N.L. (ASX:LKE) is pleased to announce that drilling is progressing well in the second drillhole, successfully intersecting concentrated brine horizons in saturated sands and silts below the 100%-owned Kachi Lithium Brine Project in Catamarca. Lithium exploration company Lake Resources N.L. (ASX:LKE) is pleased to announce that drilling is progressing (below 70m depth) and has successfully encountered concentrated brine horizons in the first drill hole under its 100%-owned Kachi Lithium Brine Project in Catamarca. Lake Resources NL (ASX:LKE) provides the Company&apos;s AGM Presentation. Lithium exploration company Lake Resources N.L. (ASX:LKE) is pleased to announce the commencement of diamond drilling over its 100%-owned Kachi Lithium Brine Project in Catamarca. All signed approvals from regulators have now been received. Lithium exploration company Lake Resources N.L. (ASX:LKE) announces that it has secured commitments to raise $1.665 million in an oversubscribed offer by way of the issue of 1,665,000 unsecured notes to sophisticated and professional investors. The intention was to raise $1.5 million but due to demand, the offer was upsized. 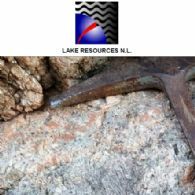 Lake Resources NL (ASX:LKE) provides the Company&apos;s Quarterly Activities Report for the period ending 30 September 2017. The directors present their report, together with the financial statements, on the consolidated entity consisting of Lake Resources NL (ASX:LKE) and the entities it controlled at the end of, or during, the year ended 30 June 2017. Lithium exploration company Lake Resources N.L. (ASX:LKE) held a successful local community meeting, together with the regulators, to complete the final step in the approval process to allow drilling to commence over the Kachi Lithium Brine Project in Catamarca. Lithium exploration company Lake Resources N.L. (ASX:LKE) has been advised that the Kachi Lithium Brine Project in Catamarca is in the final process of approvals for drilling to commence, which is anticipated to occur within the coming weeks. Argentina focused lithium exploration company Lake Resources N.L. (ASX:LKE) is pleased to provide shareholders with a video interview with Finance News Network regarding the company&apos;s four lithium projects in Argentina and current lithium demand as discussed by Lake&apos;s Managing Director, Steve Promnitz. Lithium exploration company Lake Resources N.L. (ASX:LKE) is pleased to confirm that its Argentine subsidiary has signed a Letter of Intent with the Catamarca State mining and energy entity, CAMYEN, to aid the development of the Kachi Lithium Brine Project in Catamarca. 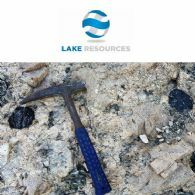 Lake Resources NL (ASX:LKE) provides the Company&apos;s Quarterly Activities Report for the period ending 30 June, 2017. Argentinean focused lithium exploration company Lake Resources N.L. (ASX:LKE) is pleased to advise that it has significantly strengthened its Board with the appointment of a new Non-Executive Director with considerable expertise in the South American resources sector. Argentinean focused lithium exploration company Lake Resources N.L. (ASX:LKE) and its Argentine subsidiary has presented details of progress at the Kachi Lithium Brine Project at the "Lithium in South America" conference in Catamarca, along with the other presenters including the world&apos;s largest lithium producers. 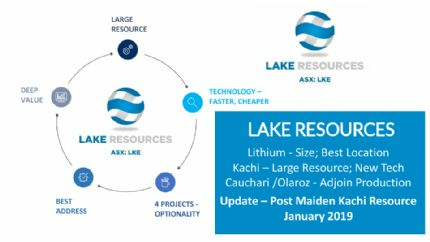 Lake Resources NL (ASX:LKE) is pleased to provide the Company&apos;s latest Investor Presentation titled "Size, Location, Unlocked Value - Lithium at a Higher Level". Argentinean focused lithium exploration company Lake Resources N.L. (ASX:LKE) is pleased to confirm the successful permitting progress of ~49,000 hectares of exploration applications at its Olaroz - Cauchari Lithium Brine Project in the Jujuy Province, Argentina. Lake Resources NL (ASX:LKE) are pleased to provide the Company&apos;s latest Quarterly Report for the period ending 31 March 2017. 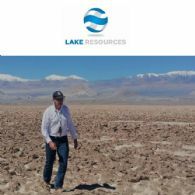 Lake Resources NL (ASX:LKE) is pleased to provide shareholders with a video interview regarding lithium projects in Argentina as discussed by Lake&apos;s Managing Director, Steve Promnitz. Argentina focused lithium exploration company Lake Resources N.L. (ASX:LKE) is pleased to report more positive lithium brine sampling results at the ~52,000 hectare Kachi Lithium Brine Project in Catamarca province, Argentina. Lake Resources NL (ASX:LKE) is pleased to provide the Company&apos;s latest Investor Presentation at Hong Kong Conference. Lake Resources N.L. (ASX:LKE) is pleased to advise that additional leases have been secured at the Kachi Lithium Brine Project in Catamarca province, Argentina. The directors present their report, together with the financial statements, on the consolidated entity (ASX:LKE) consisting of Lake Resources NL and the entities it controlled at the end of, or during, the half-year ended 31 December 2016. 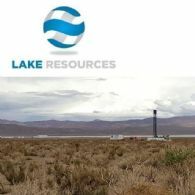 Lake Resources NL (ASX:LKE) is pleased to announce that it has issued the first tranche of 1,000,000 LKE shares to Petra Energy SA as part of an option agreement, to be fully paid in LKE scrip, over a large block of approximately 72,000 Ha of exploration and some mining leases and applications over potential lithium bearing pegmatites and pegmatite swarms. Lake Resources N.L. (ASX:LKE) is pleased to announce that it has successfully completed a capital raising of A$1.2m via a private Placement with professional, sophisticated and institutional investors. The Placement leaves the Company well funded to continue its aggressive exploration programme in Argentina over both lithium brine projects and lithium pegmatite project. Lake Resources N.L. 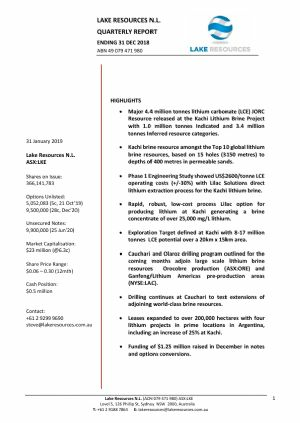 (ASX:LKE) is pleased to announce that it has significantly expanded its size and asset base in Argentina with an option agreement signed with local owners of a large block of approximately 72,000 Ha of exploration leases and applications over a newly recognised 100km long belt of potential lithium bearing pegmatites and pegmatite swarms in Ancasti, Catamarca province.